Rollin’ Stone is now at #3 on the iTunes Hip Hop charts, passing Big K.R.I.T. and hot on the tail of Waka Flocka Flame and Kid Ink! Stevie Stone’s long-awaited Strange Music debut, Rollin’ Stone, is finally here and fans are showing their support as the album has made its way to the #4 spot on the iTunes Rap/Hip Hop charts. Loaded with 16 brand new cuts from Stevie Stone, Rollin’ Stone includes the smash “808 Bendin” featuring Tech N9ne and also features appearances from Yelawolf, Peetah Morgan, Hopsin, Krizz Kaliko, and many more. The brand new release quickly made its way to the #15 spot shortly after its official release on iTunes and climbed its way into the top five overnight, placing it among albums from Waka Flocka, Big K.R.I.T., and Kid Ink. Rollin’ Stone received an extra boost following Stevie Stone’s Up All Night UStream when DJ P-Caso of Team Stone volunteered to get tased if the album reached #1 on iTunes. With a possible tasing hanging in the balance and fans hungry for new Stevie Stone material, Rollin’ Stone will no doubt leave its mark on iTunes. 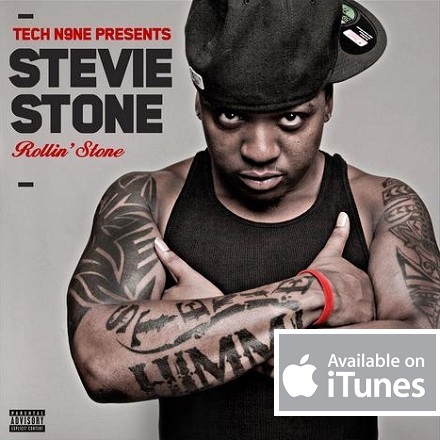 Click here to purchase Tech N9ne Presents Stevie Stone – Rollin’ Stone on iTunes! Did you purchase your copy on iTunes? Do you think DJ P-Caso will get tased?